Baby boomers are facing drastic changes in their lives as their kids grow up and move out on their own. More and more Americans are in this situation as the number of high school graduates reaches a projected peak of 3.2 million, the largest class ever, in 2008. In some cases, it can be an opportunity for boomer parents to find time to catch up with their imaginations. For John and Barbara Moeling, their southern Connecticut backyard is their kayaking haven. Motioning with her hand, Barbara in her kayak says, "Particularly if it's a beautiful sunny day out, and the water's flat, the brain goes right out there. Looking at a young swan, John notes, "My office looks right out. I can be lost in mid-sentence very easily." Barbara has continued her career as a psychotherapist since her two sons left home in the early '90s. But John took a different track. He took early retirement from job in magazine publishing. Now he's got a new home, a new passion, and a new job in real estate. He says, "I wasn't sure what I was going to do: volunteer work, a certain amount of consulting, building this house, which took a whole lot longer than it was supposed to." First came the move. Barbara says, "We wouldn't have moved up here if our kids still lived at home. You know, you have to switch their schools around." Then came their new-found passion. The Moelings discovered kayaking while visiting the Monterrey Aquarium. Barbara says, "We looked out at the water from the aquarium and there's people kayaking around with the otters and the seals. And John was like, 'Oh, I want to do that,' and I thought he was nuts so he got someone to come teach us how to do it." Their sons happened to be home for that first lesson a little more than six years ago. Now, the children enjoy the sport, too. And there are kayaks waiting when they visit. John says, "It's a super sport for people our age because 99.5 percent of your energy is directed into forward movement. There's absolutely nothing wasted at just the time in your life when you don't have anything to waste." 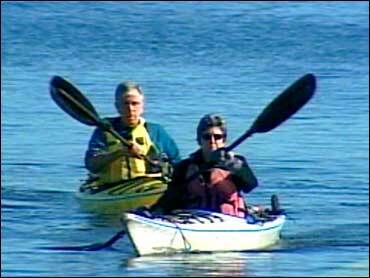 The Moelings have kayaked on both coasts, the Florida Keys and in Alaska. Their nest may be empty, but their lives are full. John points out, "No matter who you are if you have an empty nest, there are going to be times when you miss your kids. But for what it's worth, we're really enjoying it and if the kids come on back, all is forgiven." Dr. Alvin Rosenfeld visits The Early Show to discuss the types of changes that occur in the empty nest, or, sometimes, in a new nest. Rosenfeld is a child psychiatrist and co-author of "The Overscheduled Child." He tells co-anchor Hannah Storm he was surprised by the number of people who are actually happy to have the nest empty. "Finally, they could reconnect with their husbands and wives and take trips they hadn't been able to take before and it was this terrible guilty secret. The first guilty secret was they resented the rushing and they didn't want anybody to know how much they resented it. But the second one was 'I have my life back and I love my kids and they're in touch all of the time.' They go, they come back, live with you for a while, they leave but there was sense of 'I have my life finally.'" He offers tips to help empty nest parents get through it, if they are having trouble dealing with it. Prepare Before The Nest Is Empty – "It's going to come on you quickly," Rosenfeld says, "You have to prepare with a passion. Something you really want to do because it's your last time around." Enjoy Your Time – "You sacrifice so much with parenting. There is sadness about them leaving," but Rosenfeld says don't live your life just for your kids up until the moment that they leave. He notes, "I'm a scuba diver and I wish I could scuba-dive more. Other people are skiers and golfers and can finally do it." Tend To Your Physical Well-Being - A lot of people let it slide when their kids are little and growing up. He says, "After 50, it's no longer I'm going to become a better skier and better tennis player, you're working on maintenance. Take care of your body and take care of yourself so you can keep skiing or playing tennis or golf is as well as you used to." Ignore Feelings Of Guilt - Rosenfeld says, "Everybody tells you it is guilt. I don't like kids to hear this that I'm happy. I spoke to friends before who said please don't tell anybody because I don't want my kids to feel badly but there is happiness to you being your own." Dr. Rosenfeld splits his time between New York City and Connecticut. He has written four books and more than 70 articles on issues including child abuse, foster care, and psychotherapy.